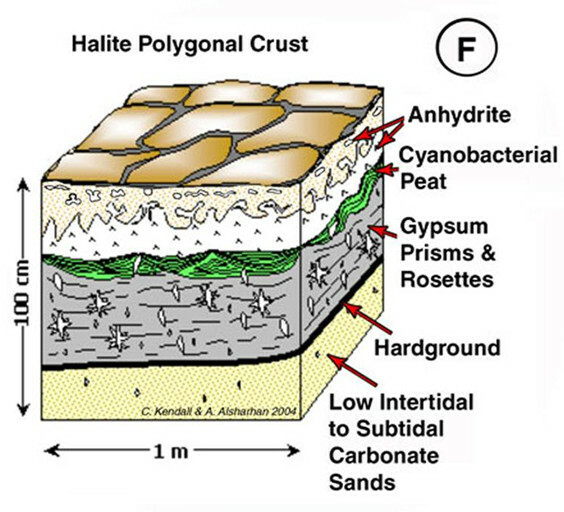 Most carbonate stratigraphic successions include repetitive metre-scale subtidal cycles that are generated by allocyclic and autocyclic processes, depositional cycles, and diagenetic cycles. These cycles contain successions that have diagenetic caps but lack depositional cycles. The mechanisms responsible for the repetition of these cycles are autocyclic and allocyclic processes. autocyclic processes are inherent in the system. 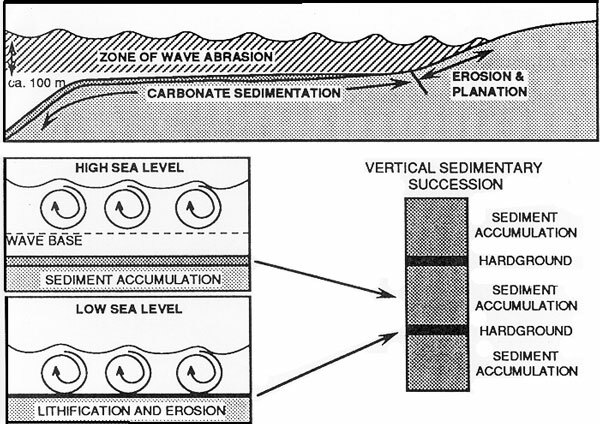 Vertical accretion occurs when sediments formed in place build on top of one another. This process occurs mainly on carbonate banks where the rate of sediment accumulation is faster than the rate of change of sea level. Lateral accretion (less common) can occur when the carbonate factory reaches a minimum depth or when sediments become piled up against the shoreline. allocyclic processes occur from outside of the system. Subsidence, eustasy, and sedimentation are all examples of allocyclic processes. Changes in sea level have a significant impact on metre-scale cycles. Storm and wave reworking control the upward limit of sediment accumulation. allocyclic processes are responsible for the shutting down of the carbonate factory. 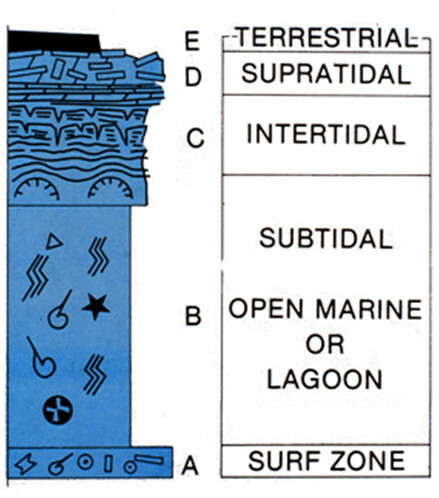 e how each sequence is bounded by unconformities created by falling sea level, and how tidal flat. Characteristics of depositional cycles include high-energy structures, such as an upward increase in grain size, bed thickness, and cross-bedding, and the lack of capping by intertidal facies or subaerial exposure features. These cycles occur most frequently on unrimmed shelves. The San Andres formation exhibits a shelf edge depositional cycle. Each cycle contains dolostone sequences varying from 4 to 10m thick and a basal burrowed organic shale, fossiliferous dolomudstone, fossiliferous dolowackestone, dolopackstone, and oolitic and fossiliferous dolograinstone. Shoaling-upward sequences are also produced by depositional cycles. There are at least two such sequences. They included the muddy sequences formed in low-energy conditions while the grainy sequences formed in high-energy conditions. There are two basic types of diagenetic cycles, those capped by subaerial features and those capped by submarine diagenetic features. cycles capped by subaerial diagenetic features are the result of exposure during fluctuations in sea level. They are most common on banks. 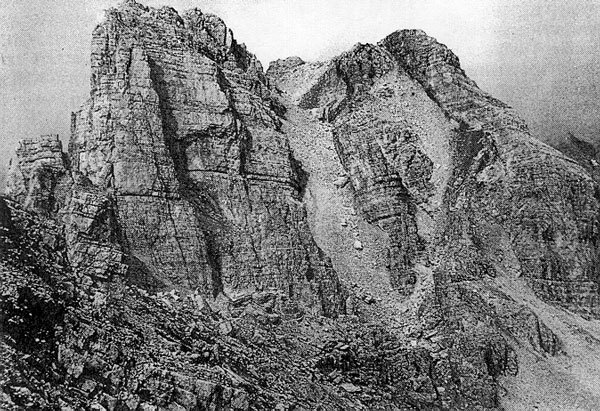 An example of this type is the Mid Triassic Latemar limestone (pictured below) which contains numerous repetitive cycles, each containing a thin dolomitized cap with vadose cements and pisoids on top of a basal, shallow sub-tidal packstone and grainstone. cycles capped by submarine diagenetic features are associated with deep open shelves. An example of this type is the Oligo-Miocene Abrakurrie limestone which contains cycles of sedimentation, which formed when the shelf was below wave base, divided by hardgrounds, which formed when the shelf was above wave base-the perfect condition for cementation. This concept is illustrated by the figure below. Below is an example of carbonate cycles from the Cambrian of the Canadian Rocky Mountains. cycles include dark, thin-bedded lime mudstone grading upward into yellow-weathering dolomite cryptalgal liminite, topped off by cross-laminate dolomitic siltstones (picture from carbonate Depositional Environments). Note: Black and white photos on this page are from Facies Models.